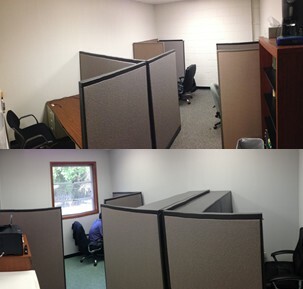 Our offices are located at ENRC 2920 and 3920 providing a comfortable environment for study and research. Our lab is located at ENRC 2933 providing many reasearch equipments including semiconductor laser characterization system, FTIR and low-temperature controller, Raman spectroscopy , solar cell quantum efficiency testing system, hall system and microbiological lab. General laser diode measurements such as LI, spectrum, temperature dependence, polarization, IV, etc. 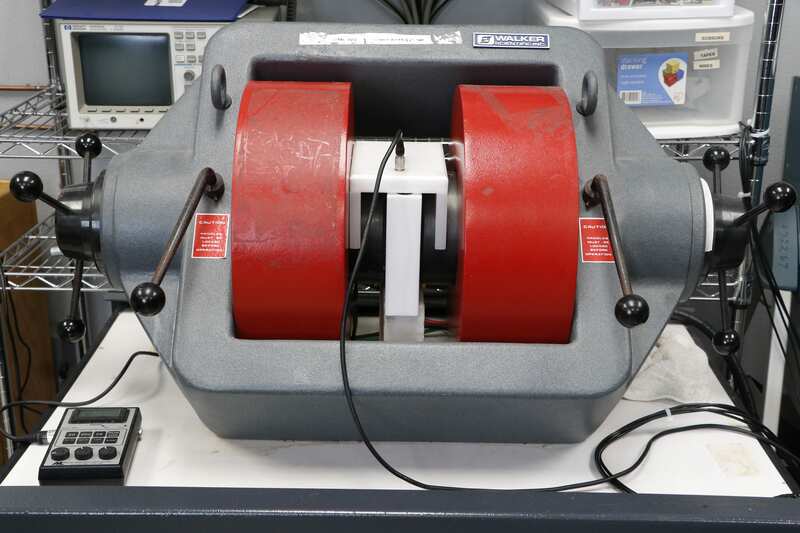 are done using a specially designed probe station impedance matched for short pulsed testing. Translational stages allow for precise placement of a variety of optical components for quick adaptation allowing a variety of different measurements. Available equipment includes ILX Lightwave LDP-3840 & LDP-3811 Pulsed Current Sources, ILX LDT-5810B Temperature Controller, ILX OMM-6810B Optical Multimeter with Si (400-1100 nm) & InGaAs (950-1650 nm) Power/Waveheads, Keithley 2400 Source Meter for IV, & an Ando AQ-6315 Optical Spectrum Analyzer. A cleaving station with translational stages & a diamond tip is also available for cleaving laser bars as short as 200 microns with accuracy within 10 microns. 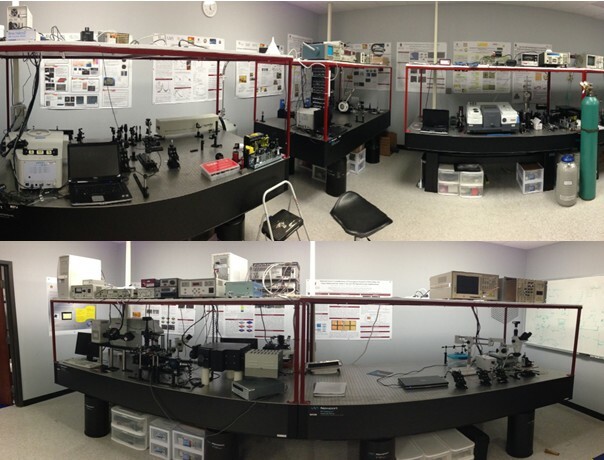 The system includes two solar simulators, one spectrophotometer, several source meters and one probe station. 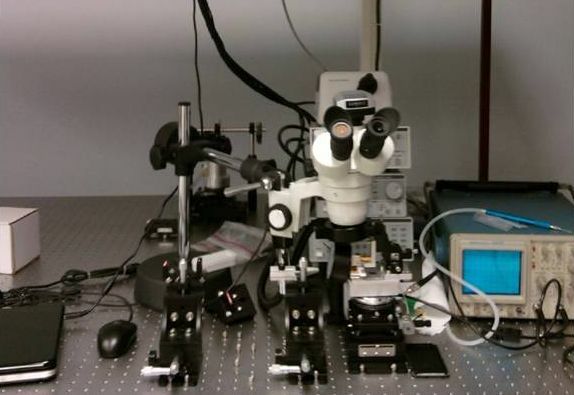 The system is capable of measuring solar cell energy conversion efficiency as well the quantum efficiency. All measurements are fully automatic. The system can also be used for visible and near infrared photodetector response spectrum measurement. A Nicolet 8700 FTIR spectrometer with LN2 cooled MCT detector and KBr beam splitter to cover wavelength range from 1um to 16 um. Two low cryostats are routinely used for low temperature optical characterizations for PL and EL measurements. 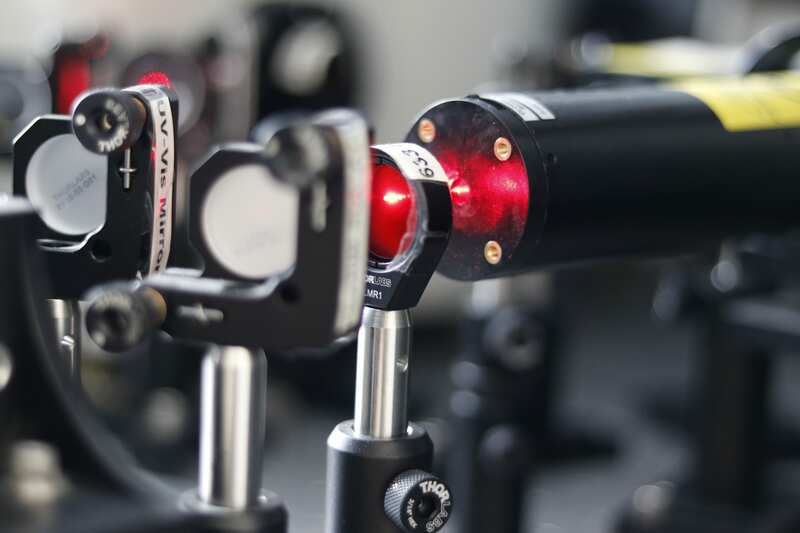 The whole system is used to characterize Mid-IR laser and detectors. A Si liquid Helium cooled Si bolometer for THz measurement will be added soon. One of the advanced techniques to measure the optical properties of different materials is Ellipsometry. Using the Ellipsometer we are able to measure the parameters such as optical constants, dielectric constant and thickness of the sample under investigation. The optical behavior of materials could be studies from UV to NIR spectrum range starting from 200 nm to 2500 nm. This Ellipsometer has also the capability of temperature dependence measurements which can be done in an specific heatcell. 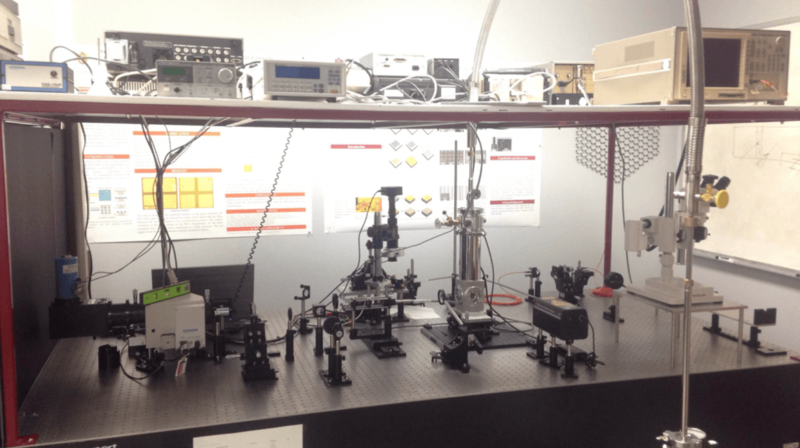 The Micro PL-Micro Raman spectroscopy setup is a home-made system provided to measure the PL and Raman spectrum in UV/Vis range. 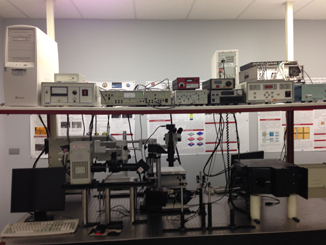 This setup includes 3 different lasers for different excitation wavelengths and powers. Lasers such as He-Ne laser (633 nm), DPSS green laser (532 nm) and especially a Nd:Yag pulsed laser (1064 nm, 532 nm, 355 nm, and 266) for high excitation power. iHR520 Horiba spectrometer including 3 grating with different groove densities to afford desired spectrum resolution. 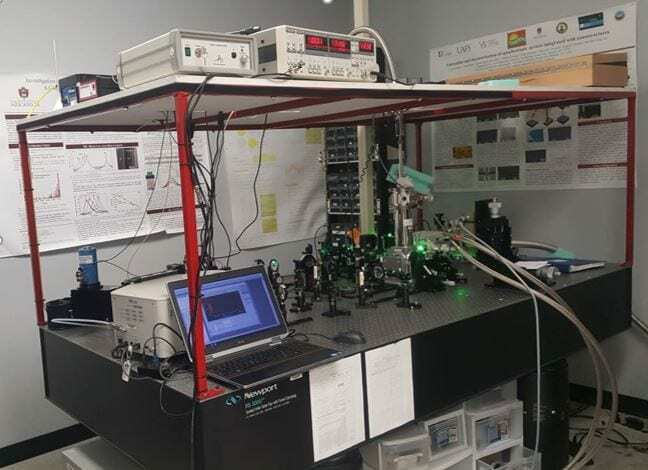 This setup is facilitated by a LN2-cooled Si CCD detector and a photomultiplier tube and capable of measuring PL and Raman spectrum from 200 to 1000 nm range. 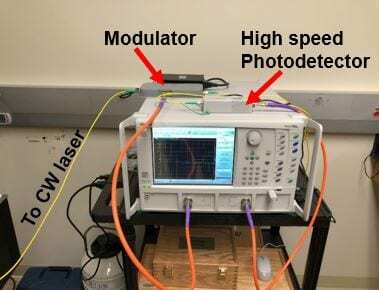 A home-made infrared photoluminescence (PL) spectroscopy setup is constructed to measure PL spectra. 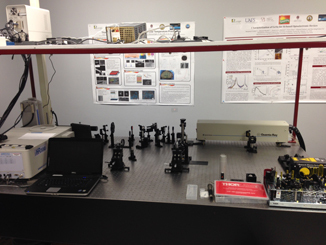 The setup is compacted with both photoluminescence and optically pumped laser measurement systems. The pumping laser sources are: a femtosecond (fs) Ti: sapphire laser （690, 1040, and 800 nm up to 3.5 W, ns Q-Switched DPSS laser (1064 nm up to 15 nm) and Q-Switched fiber laser (1950 nm up to 1.6 W, shared by UAPB), CW fiber laser (1550 nm up to 15W), DPSS CW laser (532 nm up to 500 mW). Detection range is covered by using MCT, InSb, PbS, and extended-InGaAs detectors. 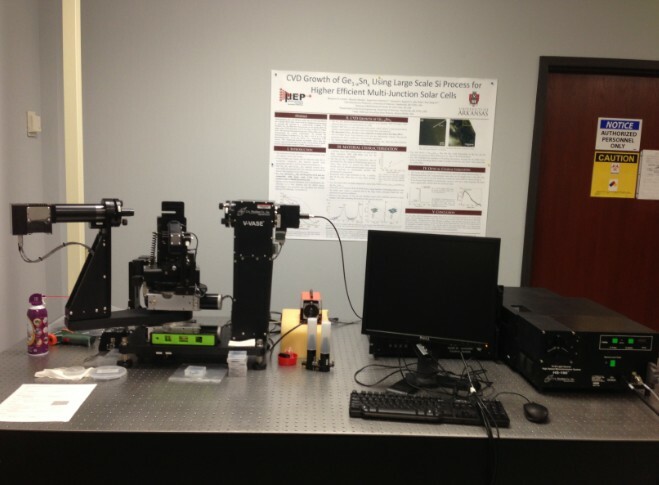 This setup has the capability to be used as off-axis PL, MicroPL, and optically pumped laser configuration. A microscopic compatible cryostat enables the temperature dependent PL measurements for micro scale devices. The optically pumped laser setup is enabled by cylindrical lens and automated power control system. 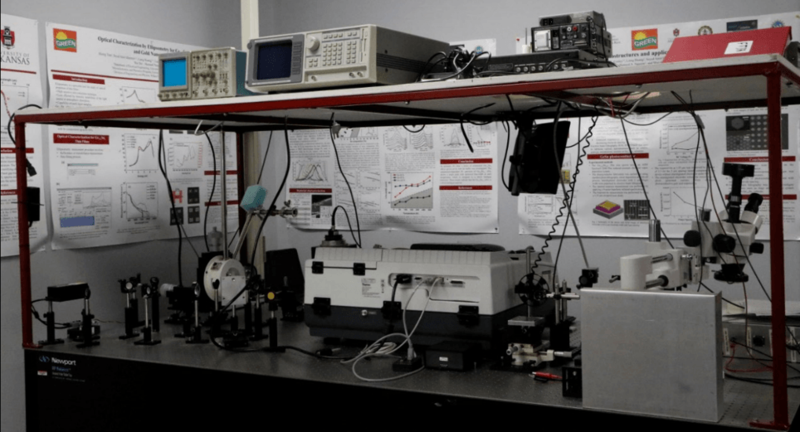 The IMWP setup, located at the University of Arkansas Pine Bluff (UAPB), is designed to conduct high-speed RF measurements on microwave photonic devices to test their characteristics including frequency response, bandwidth, and linearity. The setup includes a vector network analyzer (VNA), a modulator, a detector, and an RF probe, all with the maximum frequency of 40 GHz. The IMWP setup is also equipped with a supercontinuum pulsed tunable laser (wavelength range between 1600 to 2400 nm) and a continuous-wave (CW) laser (wavelength range between 1500 to 1650 nm) as a source. 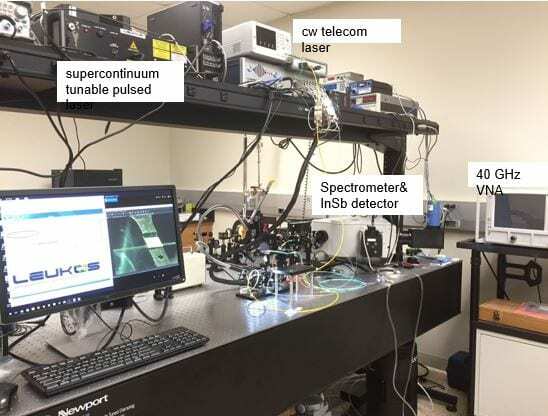 The setup also includes a piezoelectric probe station including piezo-controller stage with computer-controlled fiber holders and fiber arrays for vertical and horizontal coupling; top and side cameras, fiber collimators; polarizer and half-wave plate; spectrometer; lock-in amplifier and IR detectors (detection range from 800 to 5000 nm) capable of characterizing passive devices, including waveguides, grating couplers, Y-branches, interferometers, and ring resonators. The IMWP setup is a unique system that provides a continuous laser wavelength tuning that can be upgraded to mid- and far-IR wavelengths (beyond 2500 nm). We have designed and built a unique custom-made UHV-PE-CVD reactor machine dedicated for device quality growth of epitaxial thin films. This machine has been built for group-IV material films growth such as SiGeSn. It is equipped with two vacuum chambers; the load-lock chamber and the process chamber. The load-lock chamber is used for loading inside 4” wafers and after achieving a pressure in the range of 10-9 Torr, wafers are transferred to process chamber via a transfer arm. The process chamber attains a low pressure in the range 10-10 Torr by cryogenic pump in addition to turbo pump. 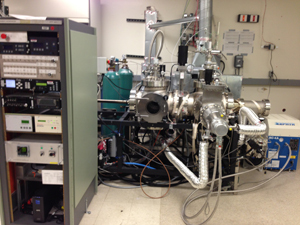 One dedicated JEOL JBX-5500ZD electron beam lithography writer purchased by our NSF EPSCoR project was installed Nano Institute at University of Arkansas, Fayetteville. The system is now under the management by Nano Institute. This will greatly enhance our nano-fabrication capability on campus. Room temperature Hall measurement and resistivity measurement system. Low temperature measurement capability will be added later. General microbiological experiments such as bacterial culture, plaque assay, etc. are done in microbiological lab for short pulsed testing. Safe manipulation to microorganisms could be achieved in Biosafety cabinet. Autoclave is used for multipurpose sterilizations. Incubator allows the microorganisms growing very fast at proper temperature. 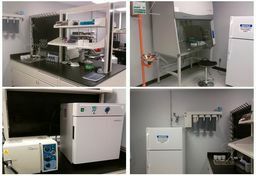 Also refridgerator, vortexer, spectrophotometer, water purifier system, stirrer are available in lab. Various computational tools are available for optoelectronic and photonic devices simulation: Silvaco, Lumerical, Crosslight, RSoft, and etc.